New to modded Minecraft? Never used ATLauncher? 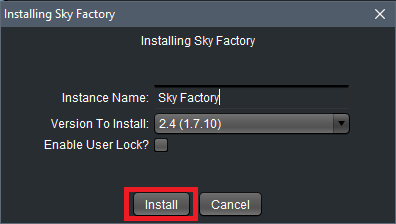 Not to worry, just follow this guide and you'll be playing SkyFactory in no time! Go to https://www.atlauncher.com/downloads and select your operating system from the three download links at the bottom. 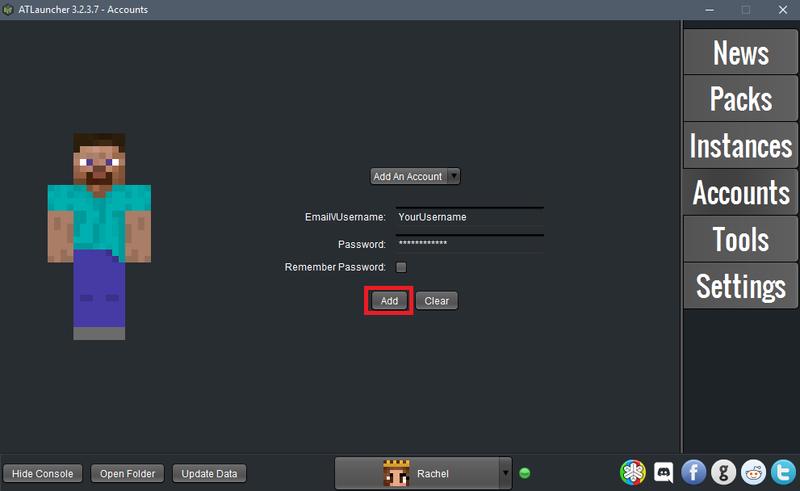 Click on the "Accounts" tab and add your Minecraft account. I do not recommend checking the "Remember Password" box. 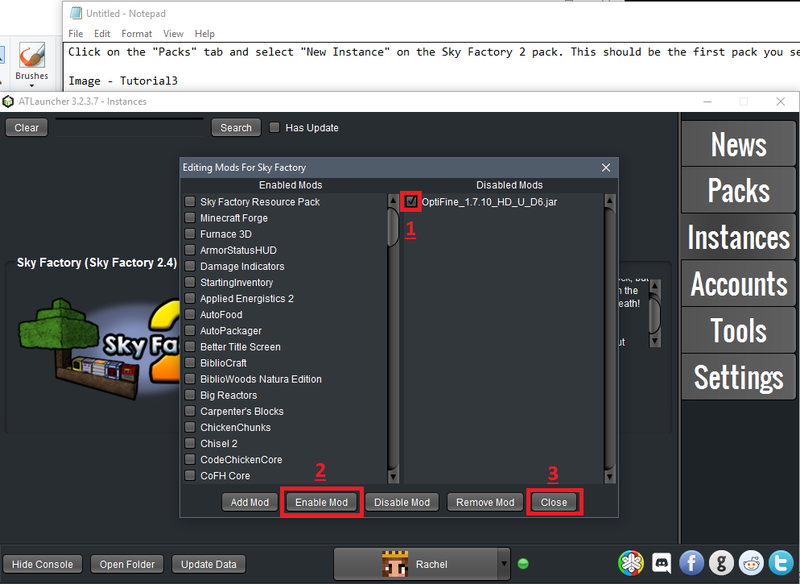 Click on the "Packs" tab and select "New Instance" on the Sky Factory 2 pack. This should be the first pack you see. Click the "Install" button on the small menu that pops up. Check the boxes by Lucky Blocks, MorePlayerModels, Tails, and Vein Miner. 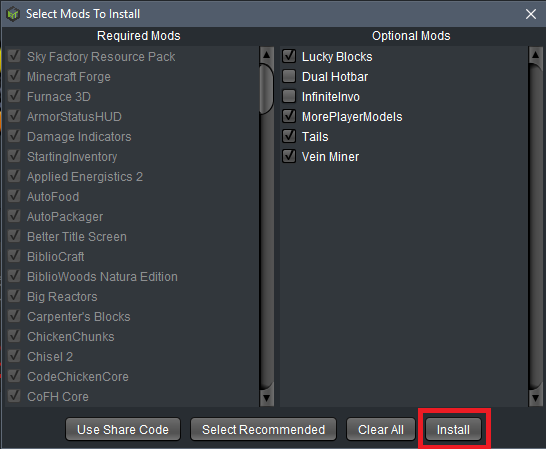 Leave the boxes by Dual Hotbar and InfiniteInvo unchecked, then click "Install". If you choose to skip this step, proceed to step 12. Go to optifine.net/downloads.php and download OptiFine 1.7.10 HD U D7. Do not install it; ONLY download it. 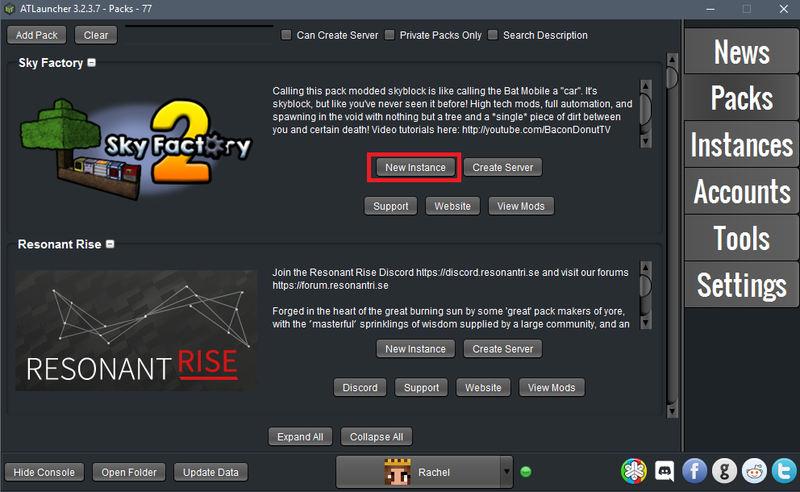 When the modpack is done installing, click on the "Instances" tab and select "Edit Mods". 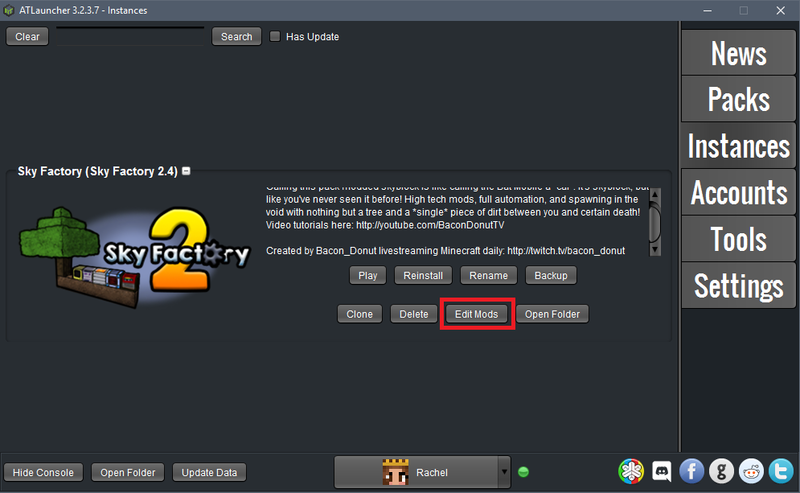 the Optifine file (by default, in your "Downloads" folder) and select it; then hit "add". 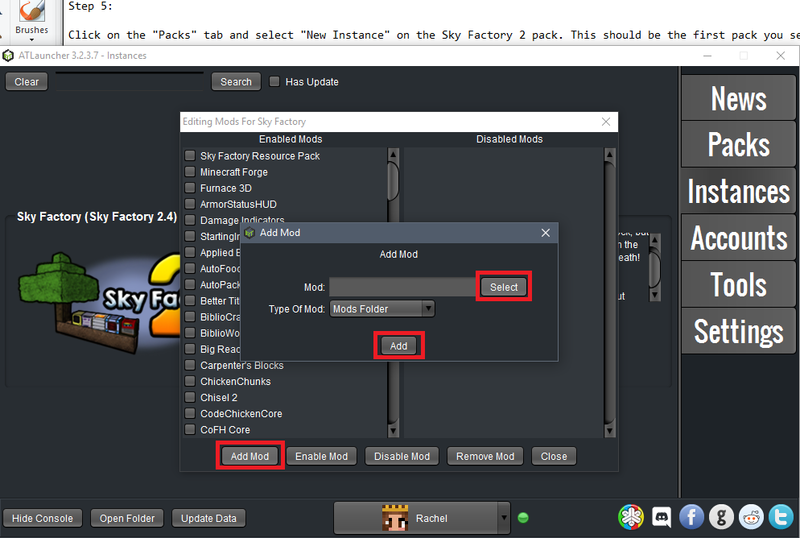 Check the box next to Optifine, then hit "Enable Mod". Close this window. 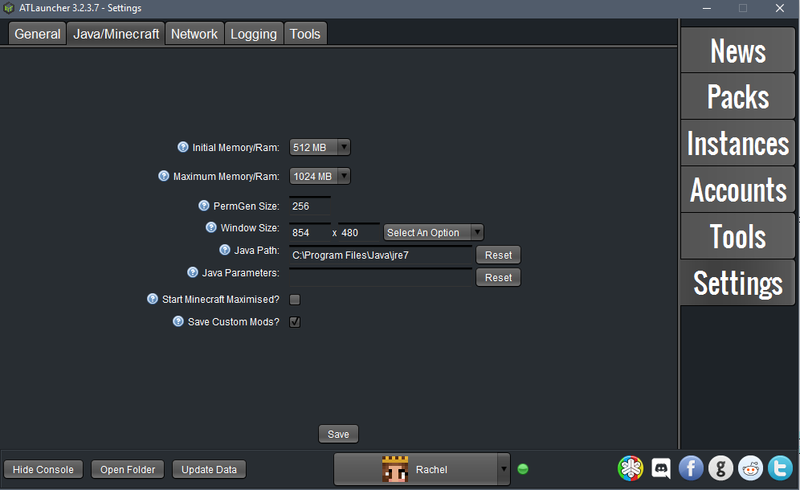 Click on the "Settings" tab, then click on the "Java/Minecraft" tab. Make sure that your Initial Memory/RAM and your Maximum Memory/RAM is set to at least 1024 MB (preferably 4096 MB if your PC has at least 4GB RAM). It is possible to load the game with these settings, but it may freeze or crash during initialization, and you will experience lag in-game. Higher values up to 4096 MB are recommended. Click on the "Instances" tab and then click "Play". Depending on how powerful your computer is and how much RAM you allocated, the game can take up to 10 minutes to boot. This is normal and you should not be concerned. If you followed steps 8-11, don't forget to click "Options" when your game boots up and adjust all the new Video Settings options that the Optifine mod has added, especially making sure that you turn Fast Math to On, Graphics to Fast, Smooth Lighting None, Fog off, Trees to Fast, and most important if you lag: TURN OFF ALL PARTICLES. Hopefully this tutorial has helped you and I hope to see you on the server soon!